User Summary: Alternate rules for magic based on the tapping of one's own energy. 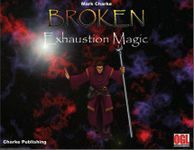 Exhaustion magic is not new but it was going to be. The wizard Cornelius Durmshar was developing exhaustion magic before the destruction of Solaris. There was not much interest in his work and so getting support for the expensive research was difficult. Never the less, he spent a lifetime working on the new form of magic and was about to release his findings when Solaris was destroyed.